← Jamie Oliver’s Sausage Gnocchi – Veganized! I am particularly drawn to recipes with such ease yet look beautiful and like you’ve embarked on some complex culinary assault course. This recipe is one of those. Easy, pretty, yummy and adaptable. I made this for a Mother’s day dessert a couple of weeks back, but unfortunately we were all too full up to have it after picking at rice salad, stuffed peppers and olives all day. Beauty is, it can be frozen and reheated in the oven. I’ve been on a bit of a VeganYumYum mission lately, making versions not only of this tart, but cupcakes and a delicious banana cake. 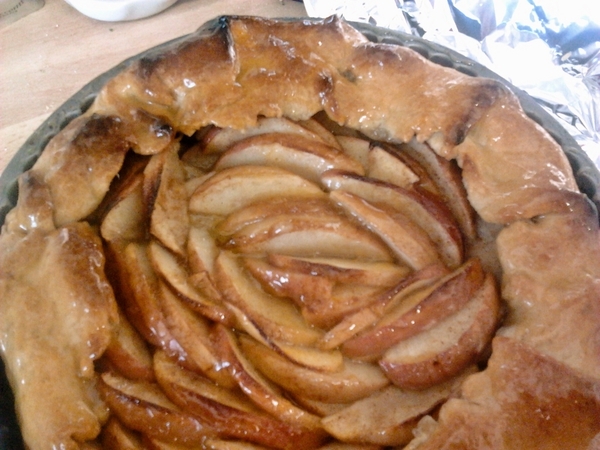 Makes one nine inch tart. Serves 8. To make the pastry, simply blitz the flour, salt, sugar, cinnamon and fat together in a food processor until at a breadcrumb consistency then slowly at a tablespoon at a time, add the liquid and pulse until the paste just forms starts to clump and form a ball. Gather together and wrap in clingfilm and place in the fridge to rest. Preheat your oven to 200’c/400’f. Half fill a large bowl with cold water and add the lemon juice to it. Core the apples, then cut in half and slice thinly. Adding them to the acidulated water as you go. Roll the dough out about 1/2 cm thick on a floured board or parchment paper, it should be larger than your 9 inch tart tin on all sides. Roll the dough around the rolling pin and unravel over the tin. Work the pastry into the corners gently. Spread 2 tbsp of the apricot spread over the base. 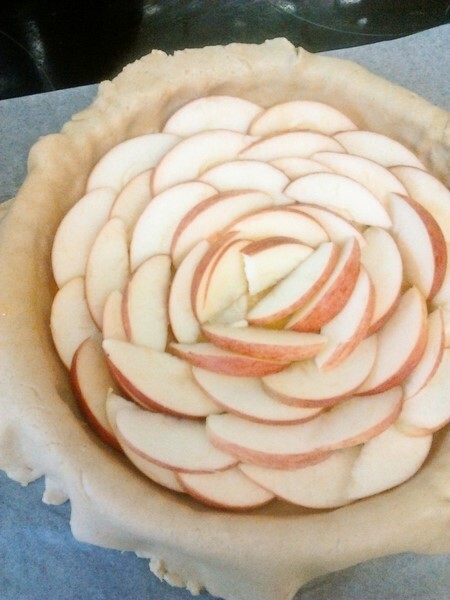 Start arranging the apple slices, from the outside into the centre, overlapping each layer slightly. 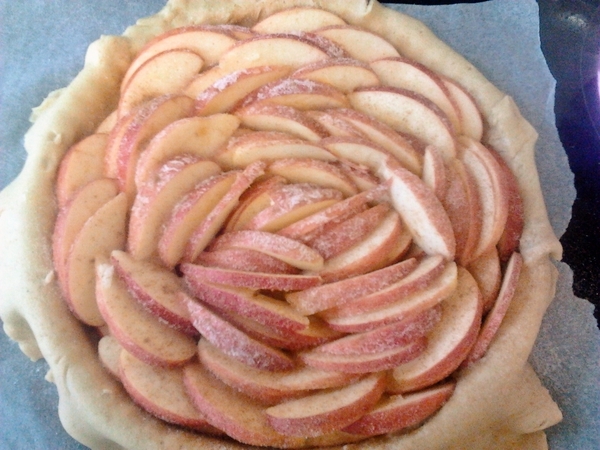 Once all the apples are in the case, sprinkle with 2 tbsp of the sugar and spices. 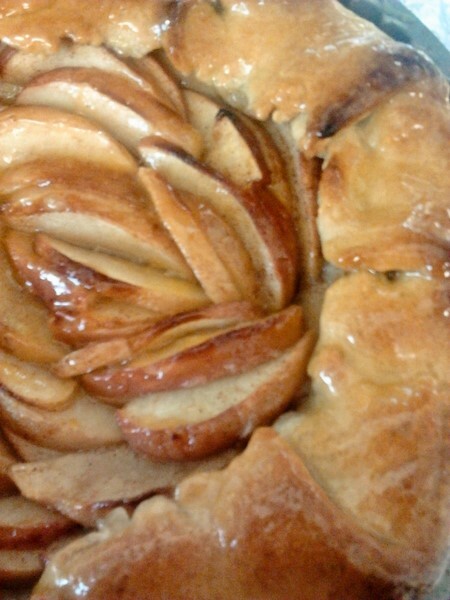 Bring the pastry overhang into the centre, to cover the filling (not fully). Brush all over with the melted margarine then sprinkle with the remaining tbsp of sugar. 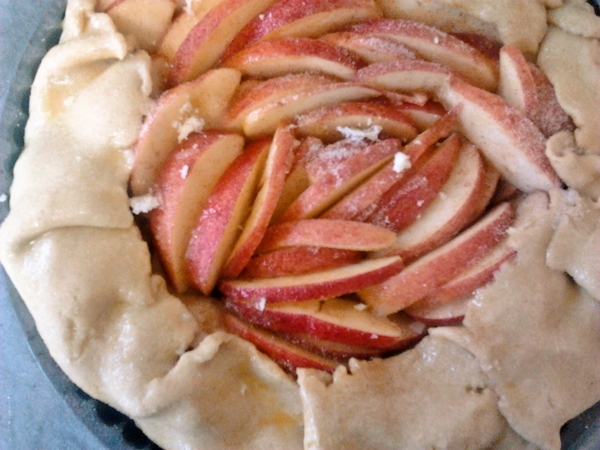 Bake for about 50 minutes, or until the tart is golden brown. Glaze with the remaining tbsp of jam that has been warmed. 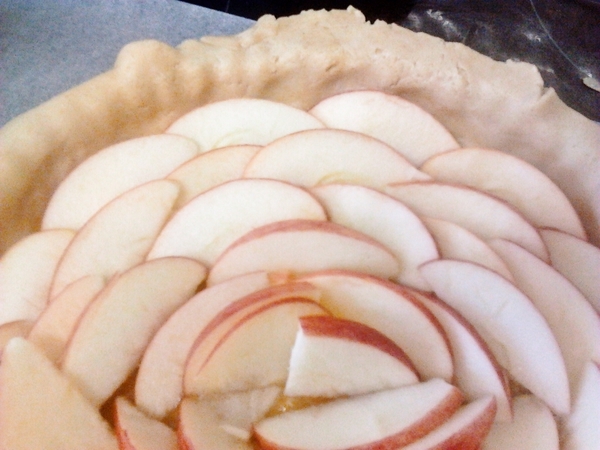 This entry was posted in Desserts, French, Fruit, Tarts and Pies and tagged apple tart, apples, baking, dessert, food, recipe, vegan, vegetarian. Bookmark the permalink. Hi Poppy, I have nominated you for the Super Sweet Blogging Award! Thanks for “liking” my last post. I’m a beginner blogger so every “like” is mega exciting! I love this recipe-as it’s a prettier take on apple pie and I also like the way you add lots of nutritional info to your recipes-keep up the good work! Thank you for your compliments! Also, welcome to the world of blogging! I love your Mediterranean themed recipes, many I’d like to veganize!